In a medium bowl, combine the garlic, oil, water, lemon juice, and sugar until dissolved. Remove ¼ cup of the marinade, stir in the soy sauce and set aside for later. Place the pork chops into a large freezer bag then pour in the marinade. Remove the air then seal the bag well. Let sit for 20 minutes in the fridge while making the side dishes. Preheat a BBQ grill or frying pan to medium heat. Remove the pork from the marinade then place on the hot pan or grill. Throw out the marinade. Cook until the juices run clear and the internal temperature is 160 °F. Place the meat in a dish, pour the leftover soy marinade and the green onions over the pork and cover to rest for 5 minutes before serving. Food doesn’t have to be complicated to be delicious. A simple marinade transforms these pork chops into a tender and flavourful dish served with rice and any vegetable. 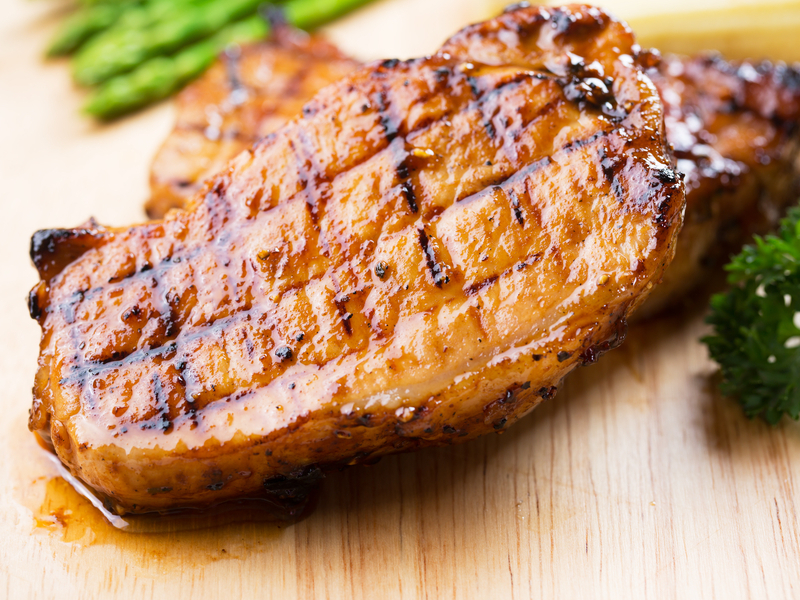 If the pork chops have a thick band of fat around them, trim away as much fat as possible then make small slits on the remaining fat to prevent the pork chops from curling while cooking.